Saira McLaren, Untitled (Reflection), 2014, pigments on raw canvas, 36 x 48". For her first solo exhibition at this gallery, Saira McLaren shows nine paintings and three porcelain ceramic pieces that evince a keen empathy for materiality, color, and the mutability of form. The sculptures, all untitled and produced in 2014, are craggy lumps glazed in mint green and patched with gold, and sport alternating pockmarked or scaled surfaces like a coral fished from the deep. The paintings are wildly colorful yet somewhat ghostly due to how they’re less painted than stained with dye and pigment. Gestural marks are marshaled into a focused flow, evoking fantasy landscapes or the flat, dense style of graffiti signatures. The colors—turquoise, hot pink, apricot, gold, and lime—dance around and through one another, here as a bold puddle or there as a wispy, worming line. Each element holds the hand of the other, as in the three smaller paintings displayed in the front room. One of these, Birds in Spring, 2015, features soft lines that coil and swarm around one another in a pattern that would look equally at home printed on silk as on a city’s brick wall. The jettisoned perspectives and lack of representational anchoring in these three works feel less encumbered than the larger paintings in the back of the gallery, which hint at psychedelic expanses of nature. 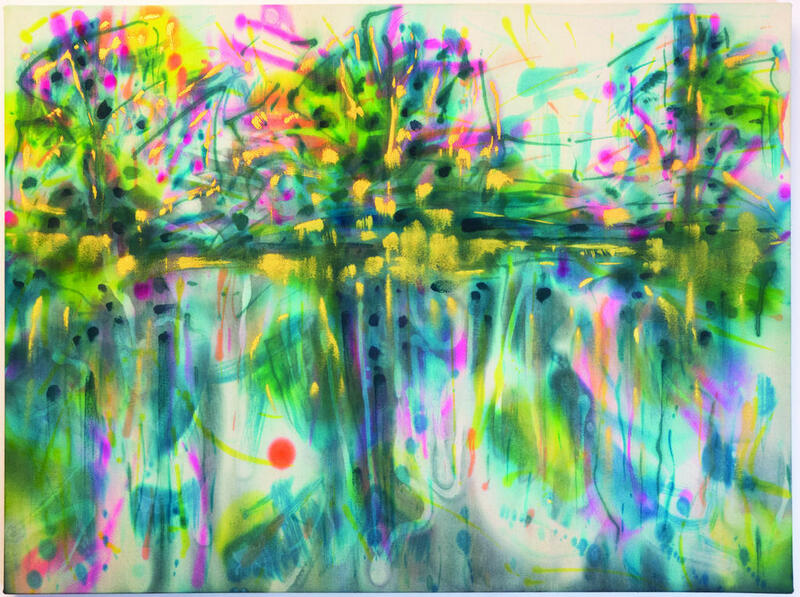 However, Untitled (Reflection), 2014, is the exception within these larger works, featuring a row of three teal trunks exploding with gold and pink dots and forest-green streams that echo below in a reflection dripped over the lower part of the canvas. It looks washed away, as if a rain had come and dissolved its structure, leaving the picture to cry itself into a smeared abstraction. Ruined, but free.